Right alongside Metro Transit's Green Line corridor will be a new five-story, upscale apartment building. The building, called Raymond Avenue Flats, was just approved by the St. Paul City Council. The Exeter Realty proposal was opposed by St. Paul's Heritage Preservation Commission (HPC) because the Raymond Avenue Flats would alter a protected commercial building in the University-Raymond Commercial Historic District. Despite the objection from the HPC, the proposal was approved to build this new complex. The new building will be built behind the protected, but vacant commercial building. The protected building, known as the General Motors Truck Co. building, will also attach to the new five-story apartment complex. The new building has every intention of keeping the protected building in tact and it will not in fact alter any of the area's existing structures. This new luxury building will be a nice addition to the neighborhood and will surely have plenty of tenants when it opens. 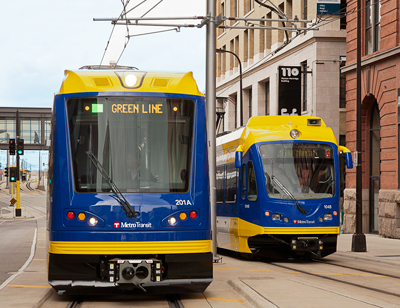 Easy access to St. Paul and the Green Line is a huge plus for anyone looking for a upscale place to call home.